Breakingviews’ alternative gauge of activity recovered slightly in February to its highest level since last spring. Chinese New Year celebrations and a bump in exports gave the economy a temporary boost to offset falling steel production, rail freight volumes and truck sales. 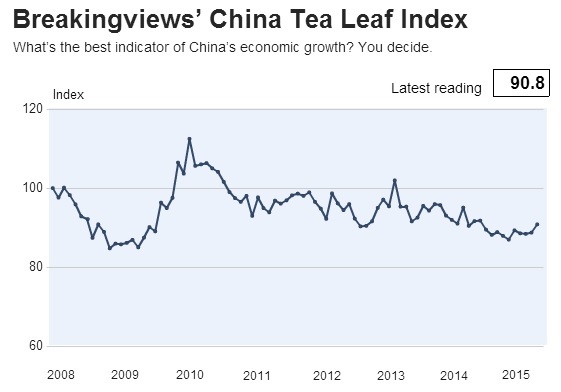 The Breakingviews China Tea Leaf index gave a reading of 90.8 in February, up from 88.8 a month earlier. Chinese New Year fell in February 2015 this year. Last year, celebrations took place in January. This may have contributed to a higher reading. Exports were up 48 percent year on year in February. Note: As of 2015, we have replaced truck sales by value with truck sales by volume. Historical data has been updated to reflect this change.